Who listens to the bass in Black Metal? | Mehta Kya Kehta? I don’t really listen to the bass in BM, but I think I will miss it if its not there. the sound will be missing a little something. for example, the song ‘through the hallways of narak’ the part where you are singing “Satan… bless my soul Father… we are yours……. ” sounds more evil with the bass. IMO, bass is a “nice to have” in BM. Oh, I didn’t play bass on Devil Worship. Asmo did. I find the first two EPs more listenable in terms of sound; ItNoS sounds exactly as raw as it should (and the bass is inaudible), and TDoB is exactly as fuzzy as it should be (and my Burzum-influenced bass-playing is on it). It’s thoroughly useless if you ask me. Unless you have a bass n drum dominant band like Necromantia. But none of those fancy bass twang things, please. Inaudible or something Satyajit Ray would approve of! I feel sorry for bassists in black metal bands. They’re about as useful as birth control pills are for men. Birth-control pills are as useful for men as they are for women. 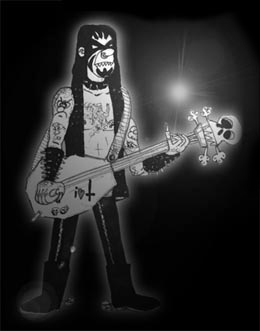 But a Black-Metal bassist who actually understands the style and loves the music would be great to have! You’re an idiot with a very rudite understanding of black metal. There are a ton of BM styles that incorporate bass in to their core sound. I bet you sound like an unoriginal Darkthrone rip off. Instead of betting on it, you could have clicked on the links and checked out the sound.